A good example of this can be found in Prigov’s Grobiki otrinutykh stikhov or Little Coffins of Rejected Verse (about which I have written more extensively in A Common Strangeness). The Little Coffins comprise a numbered series of paper packages stapled on all sides that contain Prigov’s “rejected verse,” either on a whole sheet of paper or in confetti-like strips. 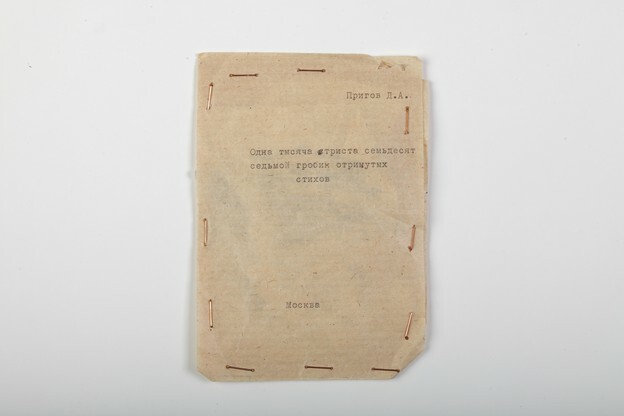 The packages, with their hand-typed covers, resemble samizdat books. Numbering in their thousands, Prigov’s Little Coffins parody the exuberant textual excessiveness of samizdat culture—the “graphomania” that Prigov celebrates and parodies in his own vast poetic output (he aimed to produce 24,000 poems by the year 2000, one for each month of the two millennia). Yet the package-books are sealed and coffin-like, suggesting the burial of Russian culture in samizdat under the system of Soviet censorship that condemned many texts to the death of nonpublication. While satirizing and celebrating Soviet samizdat culture, the Little Coffins gained new currency in the late-Soviet moment when the conduits of exchange between Russian and Western contemporary art and literature broadened. They came to stand for the burial of Soviet culture as a result of the liberalization of publishing. They also represented Prigov’s own rebuilding (perestroika) and rearticulation of that culture through works that appealed to the exchange value not of words on the page, but of contemporary art operating within a globalized market system. During his 1989 trip to Leningrad, Prigov gave Michael Davidson a Little Coffin, which Davidson went on to cite as one of a number of “signs of community, in many cases, among total strangers” that he found in Russia. Davidson here expressed the dream that a transnational poetic collectivity might unite East and West under the utopian signs of Russian modernism. But as Davidson also wryly noted, Prigov’s calling card was “written in roman characters, as though for Western export.” Seen in this light, the Little Coffins are the ultimate globally marketable local product for a poet whose work would otherwise be limited to a Russian audience, since one cannot—and in fact must not—read them. The Little Coffins suggest a parallel between the subsuming of local particularities in a new global system and the negation of authorial agency. As with much of Prigov’s work—and many recent English-language conceptual texts—they are characterized by a template structure that can produce a potentially endless volume of material. These serial conceptual writings highlight the comprehensiveness of structures or systems imposed by theoretical thinking, suggesting a totalizing treatment of linguistic material that seems to reduce the author to a cog in the linguistic machine. The sealed packages underscore the apparent death of the author by condemning the poet’s words to the graves or coffins of the work’s conceptual design, and sealing the local, belated poetic product within the globally marketable packaging of contemporary art. But positioned between Soviet samizdat culture and the international art market, the Little Coffins stand at the intersection of multiple systems of iteration and so offer another possibility. In their very undead form and parasitic relation to their “deceased” verse, the Little Coffins evoke Walter Benjamin’s concept of “afterlife” or Nachleben. Conforming to this concept, the post-Soviet afterlife of the Little Coffins interrupts the given, by stressing the continuous reworking of historical understanding at a moment of historical, social, and geopolitical change. The Little Coffins come to be read as addressing globalization, reframing their earlier examination of the fetishized samizdat text as a figure for the fragility of human life, the obsession with the poet’s or artist’s every word, and the figurative and literal death of the poet within the Russian literary tradition. The buried samizdat poem outlives the samizdat text in the post-Soviet era by becoming a kind of calling card for Prigov’s position at the juncture of late-Soviet dissident culture, Soviet ideology, post-Soviet Russian nationalism, and the global art market. Though closed forever, Prigov’s sealed books are open to ongoing iterations.